Mercy Multiplied will host its third annual Evening of Mercy at Louisiana’s West Monroe Convention Center on November 3rd. The event will serve to grow awareness and generate much needed resources for the work and mission of Mercy. Evening of Mercy will begin with a special VIP Sponsor Reception at 6:00 p.m. 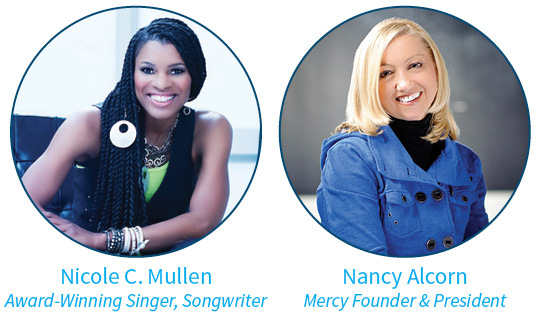 Guests will enjoy a complimentary plated dinner and program at 7:00 p.m., including special music from Grammy-nominated singer/songwriter Nicole C. Mullen and inspiring presentations from Nancy Alcorn, Mercy’s Founder and President, and several Mercy graduates. Krystle’s story is just one of many transformational Mercy graduate stories to be presented. Guests will hear how Krystle found healing from the effects of past hurt and abuse through Mercy’s residential program and how she has gone on to multiply the mercy she experienced in her work with at-risk and underprivileged kids. For more information please contact Dana at dowens@mercymultiplied.com or click here to register.